The Texture of Shadows is an astonishingly brave book. It strips the South African freedom struggle of the usual sentimental pieties and pares it down to bare essentials: love, lies and lost illusions.” – Christopher Hope, author of Shooting Angels, Kruger’s Alp and White Boy Running. A band of exiled People’s Army soldiers returns to South Africa. After years in Angola, they think the change they have been fighting for is finally about to become a reality. They have been ordered to carry and deliver a sealed trunk to an unspecified destination. It is a mission that makes them a target as different parties set out to separate the men from the trunk and its mysterious contents, setting the stage for several fierce conflicts. 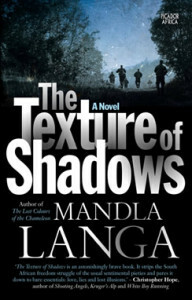 The Texture of Shadows explores a world of hardened guerrilla fighters, corrupt police officers, ex-political prisoners and the victims of abuse of a system of bannings and beatings. But there are also cracks in this steel-edged world that hope, love, and beauty can fill as the reader is swept up in the story of Chaplain Nerissa Rodrigues and her fellow soldiers.